Australian company SitePoint recently launched a new service, Learnable. Learnable is essentially a marketplace for education: you pay (very affordable) prices to enrol in a course and learn about something new, or you create a course and, if it’s approved, earn a sales percentage when people enrol. You’ll need an account to create a course or enrol in one. Signing up is free, but enrolling in a course will cost you, with prices varying based on the complexity and depth of the material. There are dozens of courses available at the moment, many of them focused on web development and technology, but with a rapidly growing expansion into other areas–such as playing the Irish whistle–we hope to be training Chihuahuas with Learnable’s help very soon. Once you purchase an enrolment in a course, you can click on “Your courses” and access the content. You navigate the course through sections called lessons, which are then split into steps. Learnable seems to remember where in the course you were up to and puts you back on that step the next time you access the course through the “Your courses” tab. Learnable seeks to make courses an interactive experience, so you can ask questions of the instructor and other students. You can subscribe to question threads by email and RSS to keep abreast of the discussion. Many online courses are very static despite the Internet’s ability to facilitate communication between a much larger number of people at once than a traditional classroom. It’s good to see that Learnable has not only made asking step, lesson and course-specific questions possible, but encourages users to stay involved with the discussions they generate. One thing to be aware of is that you only have access to the content for a year, so you’ll either want to have learned everything really well or taken plenty of notes by that time! 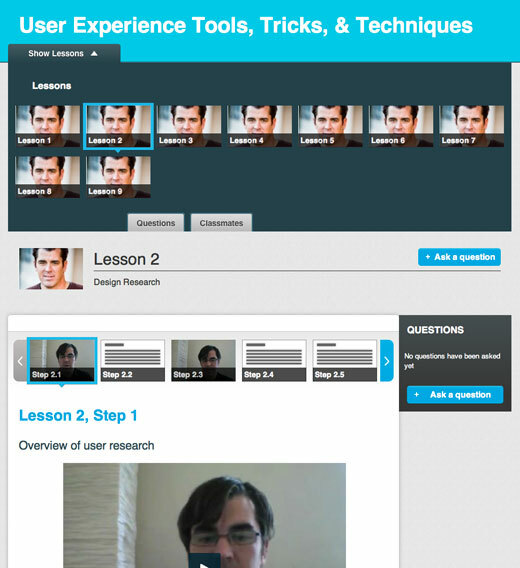 Learnable has a well-designed interface for creating courses. It’s one of the simplest interfaces for putting together online content I’ve seen–and I mean that in the best possible way. It’s definitely not underpowered, but it doesn’t inundate you with so many features and steps to complete that you’ll become overwhelmed and never finish. When you submit a course, it’ll go live on the site after Learnable staff has approved your work, and you’ll be able to earn a percentage of sales when people enrol in your course. If you enjoy educating people through the Internet, Learnable is a fantastic way to make some passive income. Steps can be articles, videos or file downloads (for instance, PDF worksheets). Learnable gives you control over the course’s schedule, which determines when students are given access to each lesson in the course based on how long you think it’ll take for them to complete. Once you’ve filled out your course with lessons and steps and finished the content, you can submit it for approval and publication. Learnable shows you a checklist of incomplete tasks on the Publish page that you need to finish before you can submit. Unfortunately, I can’t find a delete button for incomplete courses, so How to Be Awesome will have to sit there gathering dust, and giving Learnable staff something to laugh at when they come across my account. All in all, SitePoint’s newest site is off to a great site and I look forward to seeing what they do with the platform as they iterate. Definitely worth checking out if you’re in the mood for learning something new.